Summer is here and we don’t need to tell you that it’s blazing hot outdoors. While we were overrun with an abundance of spring rainfall, causing many lawns to develop fungal problems and soils to become oversaturated, we’re now in the opposite situation. The rainfall has dried up and temperatures are soaring well above 100 F degrees. That means it’s time to flip the irrigation back on and make sure we’re watering our lawns and landscapes property to keep them healthy. When temperatures are very hot and rainfall is limited, it’s not just your landscape plants and trees that will suffer; your soil suffers too. Soil that is too dry and compacted will have problems absorbing irrigation water, leading to runoff. Soil life also suffers when temperatures are very hot and soil dries out. When your soil isn’t healthy it can’t support your lawn and landscape the way it should. Timing: Be sure you are watering in the morning before 10am. It’s best to water lawns first thing in the morning so that excess moisture doesn’t stay on the foliage during the dark of night. When you water during the middle of the day, when temperatures are hottest, you’ll end up losing a good 30% of your irrigation water to evaporation. How much & how often? Deep, infrequent waterings are always more effective than frequent, yet shallow, waterings. Meaning, it’s better to water fewer times per week for a longer duration, than it is to water more times per week for shorter durations. Established lawns and landscapes do best with the equivalent of 1” of rainfall per week. However water-wise plants can thrive on less. Not sure how long to water to meet that recommendation? Set out water gauges (or small tuna cans) in different areas of your landscape to see how long you need to run each zone to deliver 1” of water. If water begins to pool or run off your property before you’ve delivered 1” of water, then your soil is probably too compacted. Core aeration of the lawn is probably in order. Then you should consider splitting up your watering times into two cycles, but on the same day. Remember that you’ll be limited to watering within your local watering restrictions. Mulch: Add a few inches of mulch to all landscape plantings. Mulch helps retain moisture and helps regulate soil temperatures. Irrigation Systems: Be sure your irrigation heads are actually watering the lawn; not the driveway or sidewalk! 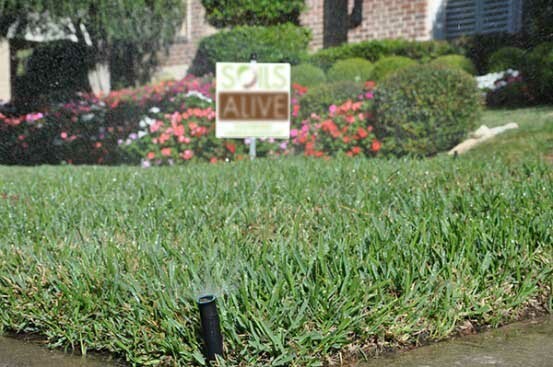 Have a licensed irrigation specialist audit your system to make sure it is working properly and not wasting water. Improving your soil’s texture by adding organic matter and other amendments to it will increase its water retention power. Liquid compost extract, worm castings, humic acid and liquid seaweed all help to increase the bioactivity in your soil. Remember, healthy soil = healthy lawn. Plants feeling heat stressed? If you are a Soil Building customer, we can give your lawn and garden a boost of liquid compost extract at the right amount in all the right places. Not a Soil Building customer? No worries! Head to your local garden center and speak to an expert about organic amendments for heat stressed plants.